Google launched the stable version of its Chrome 32 desktop browser earlier this week, but the company is also rolling out an update for the iOS and Android version as well that is supposed to help users conserve their data usage. In a post on the Chrome blog, Google said that mobile browser users will be able to access new data compression features that the company claims will reduce bandwidth usage by as much as 50 percent. That's certainly welcome news for smartphone owners who have a limited amount of data from their wireless carrier every month. 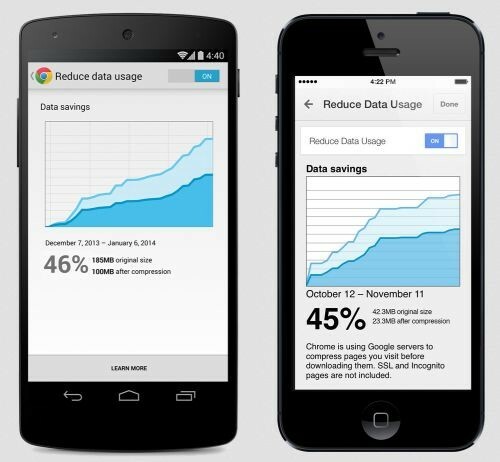 The new mobile Chrome also allows people to track how much data the browser uses and how much bandwidth has been saved compared to normal use. In addition, the Android version of Chrome will let users add shortcuts to websites to a device's home screen. Some of the shortcuts for will offer users a full screen display when they are opened and some will appear as a separate app. The iOS port of Chrome will soon include support for Google Translate which will allow iPhone and iPad owners to translate websites into a number of other languages; the new browser versions should be available for download in the next few days.